Chevalier's Books in Larchmont recently hosted a signing for Colleen's newest book, November 9, and I was fortunate enough to grab a ticket. As I said in a previous post, I hadn't planned on reading November 9 until I picked it up at the signing. Well...I lied. I grew impatient so I downloaded it on my iPad and read it in a few hours. Apparently people hate spoilers so I am not going to say much besides the fact that I LOVE that the book is based in Los Angeles! Adorable window display featuring a few of Colleen's books. When I arrived at the store, the line was massive. I squeezed through the crowed to grab my book and a number. Because Colleen has amazing fans who lined up super early, I got #173...out of a little under 200. I did like anyone else in my position would do and found a tiny kids chair to sit in at the front. I then proceeded to awkwardly lurk Colleen while she signed. As the night went on, I made lot of friends, complained a little, and clapped/screamed any time Colleen would sign more than 5 books at a time. Once an annoying southern cheerleader, always an annoying southern cheerleader. Watching people talk to one of their heroes is such a special thing and it seriously put such a smile on my face. The gifts they gave her were hilarious and I don't think I have ever seen so many neon garden gnomes in my life! (Read the Slammed series.) Want to bring Colleen a gift? She is obsessed with Diet Pepsi and Harry Connick Jr.
Somewhere around 9:45PM, it was finally my turn! The staff made a big deal and called me over the microphone to come on down, The Price Is Right Style. 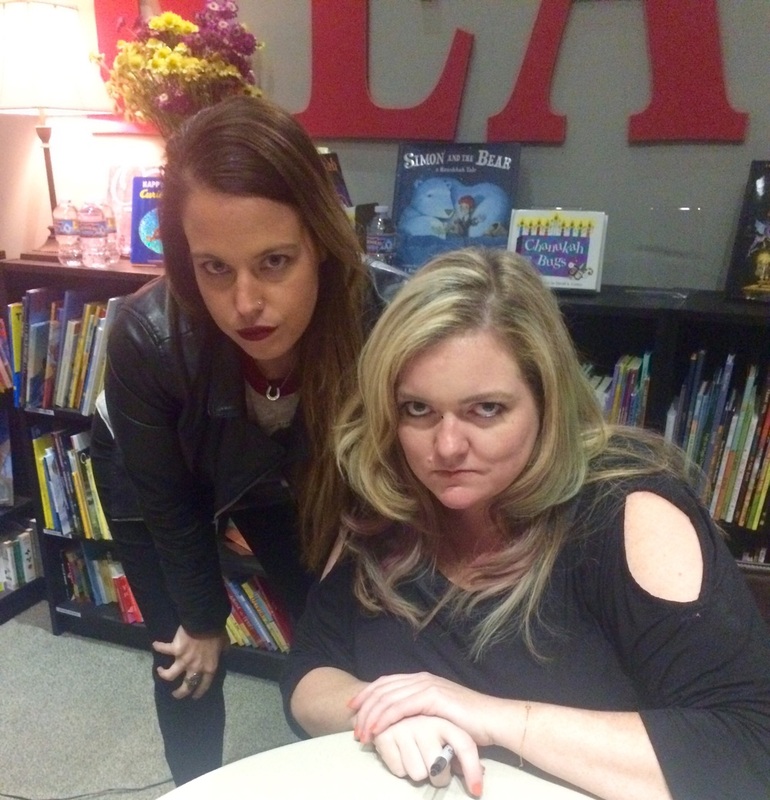 Colleen and I were basically old friends by the time I got up to the table to have my book signed. Check out my excitement that it's my turn (and likely her excitement that I was leaving soon)! If you are a fan of Colleen, you will know that her signings are "absolutely no fun" so we had a take a photo that proved it. Even though I had to wait a million years and sit in a tiny kids chair, I had the absolute best time. You won't find a nicer, more hard working or hilarious lady around. I hope that our paths cross again someday! Side note: Actor/model Nick Bateman (who is set to star in the film adaptation of Colleen's book Ugly Love) stopped by signing. Yes, he is that beautiful in person! RUN, don't walk, to read all of Colleen's books if you haven't already!